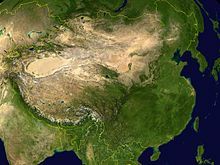 The environment of China (Chinese: 中国的环境) comprises diverse biotas, climates, and geologies. Rapid industrialization, population growth, and lax environmental oversight have caused many environmental issues and large-scale pollution. China is the 4th largest country by area, so it is geologically a diverse country. The geology of China can be divided into several parts, the loess plateau, the alluvial East China plains, mountainous regions south of the Yangzi River, and others. China is home to a diverse landscape of wildlife. It is considered to be one of the megadiverse countries in the world. Many animal species are endemic to China. China has a diverse flora, with more than 30,000 plant species native to the country. The position of the Chinese government on climate change is contentious. China is the world's current largest emitter of carbon dioxide although not the cumulative largest. China has ratified the Kyoto Protocol, but as a non-Annex I country is not required to limit greenhouse gas emissions under terms of the agreement. There are several forms of protected areas in China. Each type of protected area is protected on either a national, provincial, or county level. Rapid industrialization, population growth, and lax environmental oversight have caused many environmental issues, such as large-scale pollution in China. As of 2013, Beijing, which lies in a topographic bowl, has significant industry, and heats with coal, is subject to air inversions resulting in extremely high levels of pollution in winter months. In January 2013, fine airborne particulates that pose the largest health risks, rose as high as 993 micrograms per cubic meter in Beijing, compared with World Health Organization guidelines of no more than 25. The World Bank estimates that 16 of the world's most-polluted cities are located in China. According to Jared Diamond, the six main categories of environmental problems of China are: air pollution, water problems, soil problems, habitat destruction, biodiversity loss and mega projects. And "China is noted for the frequency, number, extent, and damage of its natural disasters". 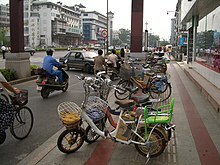 Many of the Chinese citizens started to wonder if air pollution is the cause of the increase of lung cancer. This question began to rise because the citizens in China must constantly wear face masks to avoid breathing in the hazardous particles from their polluted skies. Some experts agree that it is the reason, but others say there isn't enough evidence. Wang Ning, deputy director of the Beijing Office for Prevention and Control, says he has seen a rise in a certain cancer called adenicarcinoma, which is a mucus that is seen as a side effect from pollution. China's lung cancer rate is 32% of the entire world's lung cancer patients. Meanwhile, as lung cancer increases, gastric, esophageal, and cervical cancer have all decreased in China. ^ Edward Wong (21 March 2013). "As Pollution Worsens in China, Solutions Succumb to Infighting". The New York Times. Retrieved 22 March 2013. ^ Edward Wong (29 March 2013). "Cost of Environmental Damage in China Growing Rapidly Amid Industrialization". The New York Times. Retrieved 30 March 2013. ^ "2 Major Air Pollutants Increase in Beijing". The New York Times. 3 April 2013. Retrieved 4 April 2013. ^ Bloomberg News (14 January 2013). "Beijing Orders Official Cars Off Roads to Curb Pollution". Bloomberg. Retrieved 27 July 2013. ^ a b Jared Diamond, Collapse: How Societies Choose to Fail or Succeed, Penguin Books, 2005 and 2011 (ISBN 9780241958681). See chapter 12 entitled "China, Lurching Giant" (pages 258-377). ^ Burkitt, Laurie (10 March 2014). "Pollution: Causing Lung Cancer in China?". WSJ. Retrieved 5 May 2017.